Tucked away inside a copy of Woodcarving Illustrated1 by Roger Schroeder and Paul McCarthy were three concert flyers. 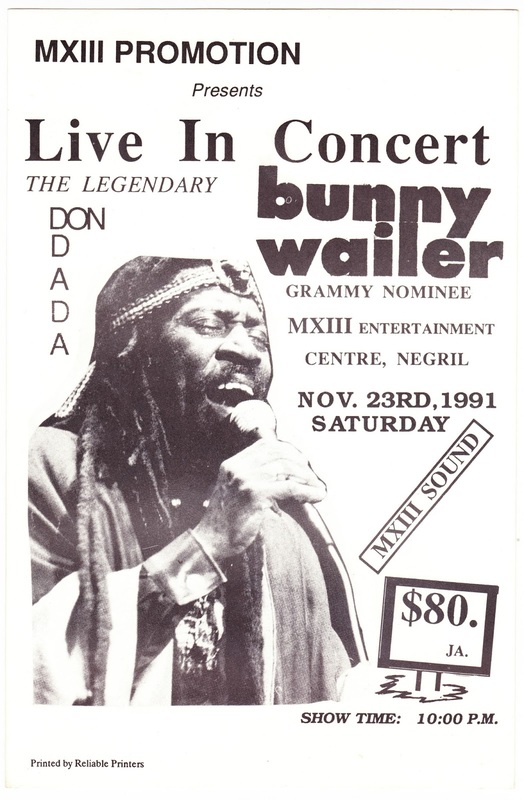 They are all for a concert that featured Bunny Wailer and was held on November 23, 1991, in the resort town of Negril, Jamaica. Bunny Wailer was a founding members of the reggae group Bob Marley and the Wailers, along with Marley and Peter Tosh (both of whom died in the 1980s). As for the "Don Dada" reference on the flyer, the Urban Dictionary tells us that it's a superlative that transcends a mere don. Don Dada is defined as "A combination of Don and Dada. Meaning the top pimp, the biggest player, and even one step above mack daddy." 1. Woodcarving Illustrated contains instructions for the following projects: Traditional New England Handcarved Pineapple, Carving the Sperm Whale, The Shell Doorknocker, The Gold Panner, Ball-in-the-Box Key Chain, Miniature Beaver and Shovel, The Carved Letter Opener, The Loon.